First and foremost many thanks to Andrew Fisher for kindly lending me this Cartridge to review! Controls, this is a one-player game controlled by a joystick in port 2. During the titles moving the joystick selects music or sound effects, fire starts the game. In-game moving the joystick moves the gun sight, fire button shoots your gun. 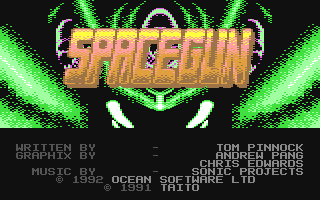 Successive Presses of the space bar cycle through any weapons you have collected, pressing fire on the gun sight joystick fires that weapon. Travel through the corridors of the spaceship and the barren planet surface searching for trapped hostages who must be rescued. As you pass walls certain shapes appear on them, shooting them will give you some of the following pick ups: A Flame-thrower, A Grenade, A Blade, A Freeze-gun, Body Armour, Red Tube - This gives you extra energy units! Yellow Tube - Restore your full energy. If a weapon is continually fired its recharge rate will drop and its firepower will become less effective. The weapons recharge rate will increase if firing is ceased. In certain parts of the game you encounter large guardians who must be destroyed before you can continue. You will fail your mission if you lose your energy or if you lose all your hostages. On some implementations you have a choice of direction to travel at certain points of the complex. Select a direction by shooting the appropriate arrow that will appear. Displayed on-screen are the current score, the time remaining to complete the current section and the number of hostages on that section. A hostage icon will blink if they have not been found, filled if they have been rescued or crossed out if they have been killed. 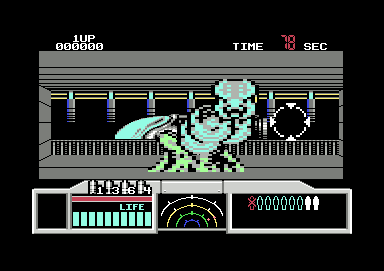 At the bottom of the screen is a radar display which will reveal some of the aliens in the vicinity and for the current player taking part a display indicating the current number of special weapons in their arsenal and which (if any) weapon is currently selected, the current energy available to the player is shown as a segmented bar and the current recharge rate. (C) 1991 TAITO CORP. All Rights Reserved. CARTRIDGE or DISK? Which is best, there's only one way to find out - FIGHT!!! I'm gonna stick my neck out here and say go for the cracked Disk version - ILLUSIONS have done a marvellous job and you get to play the game with all the levels included as it was intended. Also it features a snazzy intro-screen by them and a Trainer Option for extra lives and weapons etc. I'd still love a copy on Cartridge though... Its such a shame Ocean didn’t include that first level, it makes the gameplay So much harder than need be and will probably put a lot of people off playing it. I believe the missing level is due to lack of Cartridge Memory, strange really when SYSTEM 3 were doing LAST NINJA REMIX and MYTH - a One Megabit Cartridge!!! Next Time on Cartridge Corner - Another excellent Ocean game, wait and see what a beauty I have for you!